Learning a new, non-native language is much easier for children than it is for adults. 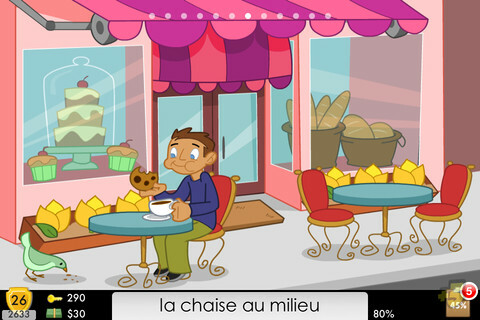 Our Free App of the Day does away with the traditional flash cards and offers players a scavenger hunt to help learn over 300 words and phrases in French. TogoTown is a fun and free way for kids to work on becoming bilingual. TogoTown offers a completely new way of learning a language. No boring flashcards. TogoTown is a scavenger hunt game where you’re trying to find items to complete your checklist. Some items need to be found while others need to be bought or traded in the TogoTown classifieds. Some items need to be won through word challenges with other players. As you find more items, you’ll gain more fluency points which will allow you to unlock more places to find more items. Before you know it, you’ll have mastered over 300 vocabulary words and phrases. The free version of “TogoTown” comes with 2 town places. Another 10 places are available as an in-app purchase. – Over 300 words and phrases to be “collected” in 12 different town places. – “Word Challenges” to measure yourself against other players and win valuable tools. – “TogoTown Classifieds” where you can buy or trade items or complete jobs to improve your skills. – Native speaker audio clips for pronunciation of clues. – TogoTown’s unique “Language Learning Method”, which personalizes and adopts the learning experience for the user based on a real-time assessment of language skills and comparison to other language learners. For information or support, contact us at support@TogoTown.com, find us at http://www.TogoTown.com or like us on facebook.com/TogoTown.